Artist Neil Slorance will draw for STV as the major incidents unfold on election night. It's a political sketch with a difference. Artist Neil Slorance will be "live-drawing" cartoons as part of STV's election night coverage. The artist will produce a series of works throughout the night as the election unfolds. He will react to the major talking points during the night, drawing cartoon snapshots of election events as they happen. 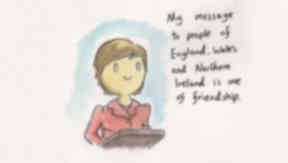 Mr Slorance, from Glasgow, came to prominence during the ITV leaders' debate in April after one of his cartoons was praised by First Minister Nicola Sturgeon. He said: "This general election has been quite exciting and unpredictable. Politicians are good fun to draw and are easy targets. They are cartoonish anyway so it is easy to take their personalities and caricature them. "During the night I will be watching the election unfold and live drawing what I see as worthy moments." He continued: "I started doing bits and bobs of political drawing during the referendum and it got a tremendous reception. I'm looking forward to doing it again for the election." Mr Slorance's artistic contributions will be available on the STV News live blog at stv.tv/election and on social media.